"You may use this package for your personal and commercial use. You MAY NOT sell or re-distribute the original package whether in whole or in parts without prior written consent from The3dZone." 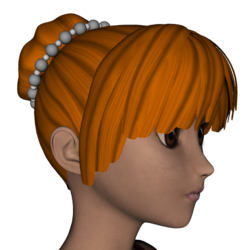 Free Bun Hair is a bun hairdo with bangs and a string of pearls around the bun, created for Aiko 3. it was previously available at The3DZone; a copy has been saved in the Internet Archive. There are separate material zones for the bangs, the bun, the larger pearls, and the smaller pearls. BJD with Free Bun Hair. This page was last edited on 4 August 2018, at 13:27.